Harvest is continuing and I thought you might like to see this. I did not make compost this year, however there is bounty from the pile. The plants are entirely volunteers. Last year we had volunteer tomatoes. 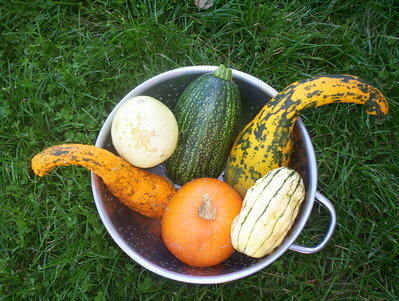 This year most is from the line of squashes, at least 3 different kinds. Maybe 4. anyway I think it would make a fine mini cornacopia. That is amazing. I love squash. It is amazing for me, that is for sure. Lol! A nice array. I see a fall wreath unless they are edible. At my house I like to collect the large acorns on the driveway and put them in a wooden bowl. My statement of fall. Just the zucchini and the melon are edible. The pumpkin may or may not be as I had both kinds planted last year or the year before. I don to have acorns around here that I know of. Are your acorns edible? No, but pretty. Well, I should say I don't eat them. I think the deer might. Yes they just came up because I did not stir my pile. Lol!